Islam is the second largest religion in the world. In this lesson, we look at the basic beliefs and facts of Islam, including the purpose of divinely revealed religions and submission to God. Islam began in the 7th century Mecca which is located in modern day Saudi Arabia. It is the second largest religion in the world. As articulated by its sacred text the Qur’an, it is God’s final religion on earth. Islam was revealed by God’s last Prophet on earth, Muhammad the son of Abdullah (s). Islam is an Abrahamic religion, meaning that it is a monotheistic religion that accepts most of the Old Testament and New Testament Prophets, including Abraham, Noah, Moses and Jesus among other Prophets sent by God to earth. Islam also believes in the Devil, in angels, including the Archangels Gabriel and Michael, as well as the Day of Judgment. Like Christianity, Islam deems charity to be mandatory. Withholding help and charity is an immoral and sinful act according to it. However, unlike Christianity, it rejects the concept of the Trinity and upholds God as absolutely one. Jesus (as) according to Islam was only a divinely guided Prophet and not God Himself. Islam is the fastest growing religion on earth and it has over 1.5 billion followers. The ultimate sacred text for the Muslims is the Qur’an. The Qur’an was originally revealed in Arabic and is believed to be the literal word of God that was revealed to the Prophet Muhammad (s) and expressed verbatim by him to the Muslim community. According to the Qur’anic narrative, Islam does not see itself as a new religion. It sees itself as the culmination of thousands upon thousands of generations of Prophetic messages which began at the time of the Prophet Adam (as), unto the Prophets Abraham, Moses, and Jesus among others, and ending with the Prophet Muhammad (s). The Qur’an is the only divinely revealed sacred text to explicitly and unequivocally claim that it is God’s last religion on earth. But why is this the case? Why can’t we have more religions? One answer is that as previous divinely revealed religions outlined guiding principles for humankind, Islam simply completed these principles to the extent that no more was needed. Everything humans need for salvation can be found in Islam in its completest form. This is easy to observe. Islam is a large synthesis of both an orthopraxy and an orthodoxy, meaning that both “right action” and “right belief” culminate under one religion. In this sense, on some level, it is like a perfected fusion of both Judaism and Christianity. As such, it addresses everything in our lives, from aspects of ritual purity, foods we can eat and can’t eat, social laws as well as issues of theological doctrine, such as the nature of God’s attributes. It also lays down social principles that act as blueprints for both honorable living in this world and salvation in the next. So to recap, since Islam contains everything needed for divine guidance until the Day of Judgment, there is no longer a need for another religion. But what does Islam exactly mean? Islam is an Arabic word. It means to serve or submit, and a Muslim is someone who serves and submits to God. Islam and Muslim are verbal nouns, in other words, they don’t just denote a state of belief, but a state of being, a state of action. Outward submission is only a small part of the story. The goal of Islam as a divinely revealed religion is not only to elicit outward conformity with God’s will, but its ultimate aim is to have the human heart submit to God in an act of devotion and love. In this act of total servitude and emptying of one’s soul of anything other than God, the heart finds inner peace, tranquility and joy. This inner transformation according to Islam is the beginning of heaven. It begins on this earth and finds its peak in the next life. city in modern day Saudi Arabia, the Prophet Muhammad’s (s) place of birth. What is the purpose of the Qur’an? It is to gear the human mind towards God and offer a social commentary for the purpose of reshaping human behavior in accordance with the Good life. Does Islam accept the Old and New Testament Prophets? Yes, it accepts them for the most part. Does Islam believe in angels? Yes, it believes in the Biblical angels like Gabriel and Michael. Is Islam a religion of belief or practice? 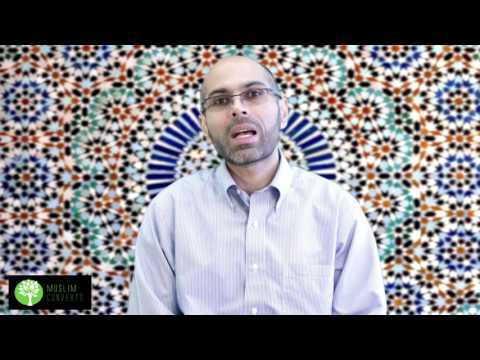 Why was the Qur’an revealed in Arabic? Because it was revealed to the Arabs who at the time were the worst of people in the Prophetic region of the Middle East. Furthermore, the Qur’an was revealed in that region as it was the center of the world where Africa and Asia connected together and thereby being an ideal place for the spread of Islam’s message.